ASUS today released “the fastest graphics card on the planet”. This AMD Radeon based graphics card is called the ASUS ROG ARES II. (ROG is ASUS’s Republic of Gamers sub-brand). The graphics card packs two Dual HD 7970 GHz Edition GPUs which are paired with 6GB of GDDR5 RAM. To keep things cool the two-slot card features a hybrid liquid and air cooling system. Now the bad news: the newly announced ASUS ROG ARES II is “strictly limited to 1000 units”. (Actually the price is also probably “bad news” but is not disclosed in the press release). 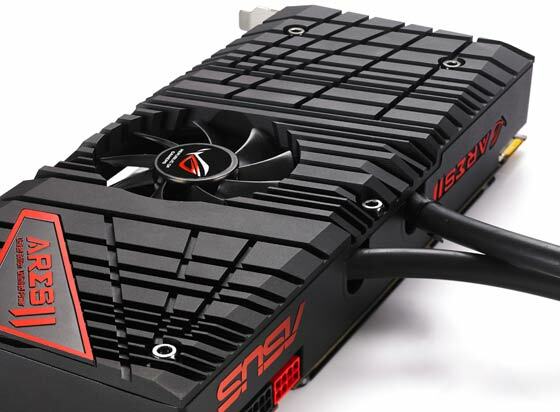 The ROG ARES II’s cooler design “allows it to achieve temperatures some 31 degrees C cooler than those of a reference GeForce GTX 690 card” according to ASUS. The card easily fits into a two slot profile while the combined liquid and air cooler fits into a common or garden nearby 120mm fan slot. 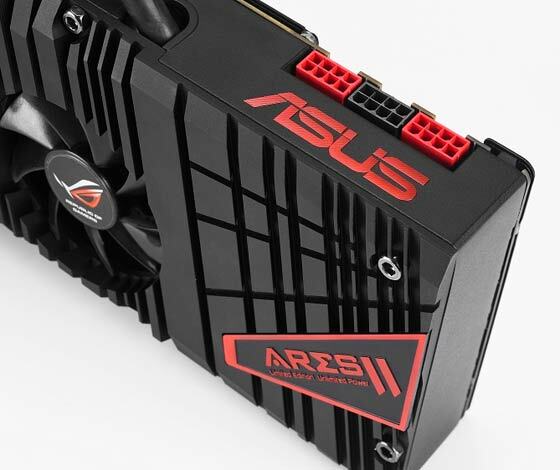 This ARES II card is made to maximise your out-of-box performance without technically challenging cooling or overclocking techniques being involved. 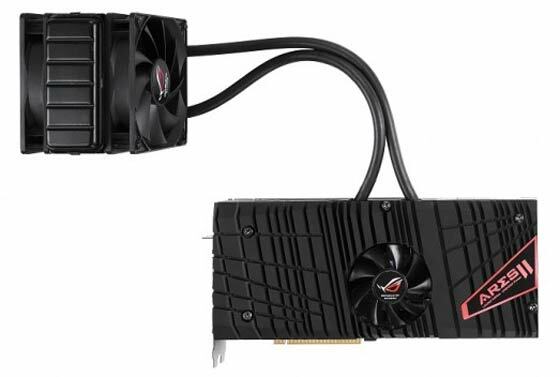 ASUS is proud of the construction of its ASUS ROG ARES II and believes that the superior cooling and the higher quality components used will enable this graphics card to enjoy a long and fruitful life. Although, out of the box, you have the fastest graphics card on the market, you can still push this card further using the bundled ROG Edition GPU Tweak utility. The utility allows users to modify card parameters including core and memory speeds, fan performance, and voltages. Settings can be saved as profiles and applied to fit your application and game usage. The ARES II debuts as a limited edition product, with only 1000 units produced. It ships in a special ROG-themed case, with each card featuring a laser-etched serial number on the aluminium backplate. Pricing and availability will be announced market-by-market. Claimed to come with 896 CUDA cores at 1486 / 1665MHz, and 4GB of GDDR5, priced at $149. Where's santa when you need him? Yeah it's definitely gonna be £1000…I just don't see the point in dropping that sort of coin on a single card, if you're paying that sort of cash you're probably gonna have an SLI/XF capable board and could get 2 seperate cards for much less with the same or better performance.